45-47 “Who here qualifies for the job of overseeing the kitchen? A person the Master can depend on to feed the workers on time each day. Someone the Master can drop in on unannounced and always find him doing his job. A God-blessed man or woman, I tell you. It won’t be long before the Master will put this person in charge of the whole operation. At the church I serve, we definitely know about kitchens. I “googled” the church this morning and wanted to see what images would pop up. This is a good exercise every once in a while to see what becomes the image of the church. The first images were of our logo and of the church building. Fair. The second images were of our kitchen. People around our kitchen. People being fed out of our kitchen and lots and lots of people. What an awesome image to have represent a church! Every Saturday morning, we have Saturday morning breakfast. Last week we fed 383 meals out of the church kitchen. 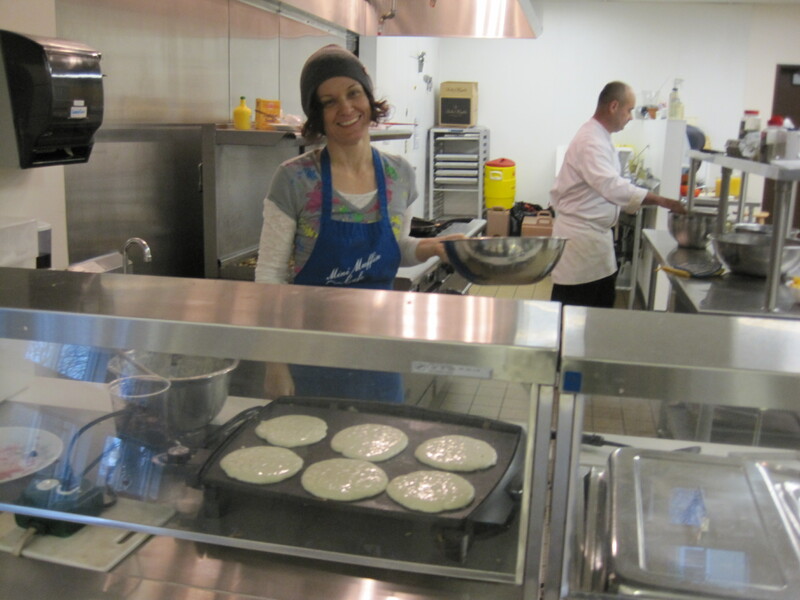 It is a great commercial kitchen and is better and better equipped to handle feeding people. Of course, we could always upgrade but that isn’t what makes it fabulous. We also have more and more volunteers. Each week there is a head chef with a crew and a front of house person with a crew. (If you look closely you will see Pastor Mark in the kitchen and Pastor Court in front of house…surprise surprise). Each manager of the day is responsible for their crew to keep moving…either in the kitchen or serving tables. We want each experience of food to be a blessed one. When I go in to serve, I am just amazed at the outcome. Each person is mission oriented. Each person is making sure good food and equality at the table happens. The diner will get a yummy experience, they will be fed and they will walk out the door warmed by hospitality. This can only happen when everyone is on board with what is about to happen. I have also been serving when it falls apart. It gets crazy. When it falls apart, communication breaks down and chaos rules. What makes it break down? The number one way that I see it breaking down, is when someone decides that their agenda is the most important one. It could be that someone in the kitchen has decided that their little area is the only area and that will be the focus…could be the plater starts to order around or the pancake maker doesn’t make sure there is other food…just pancakes. Or more often I have seen a server decide that their tables need their food before any other food goes out. They might move their tickets to the top or rearrange the pile. It can only work when everyone looks at the whole picture. All will be fed if we stay on mission. All will be fed in multiple ways if we can work together in the kitchen. Are you picking up where this might relate to real life? Jesus outlines this head of kitchen who rocks the kitchen. The only way this works is if the head of kitchen runs the kitchen well and the whole crew is on board. The whole crew gets on board by the head of the kitchen making the mission clear. The head of the kitchen cannot break off and do his or her own thing. The same must for us as well. We have to be all in, no parties, but we also must be part of the whole. If the person only looks out for himself or herself, the whole thing won’t work…there are fights and priorities shift and no one gets fed. I am proud to be part of a place that feeds people…literally. I also know that we can learn a lot from the parable. What do you think? Where are you in the kitchen?